Golden Chariot is a super luxury tourist train operated by Karnataka State Tourism Development Corporation, a Government of Karnataka undertaking in India. 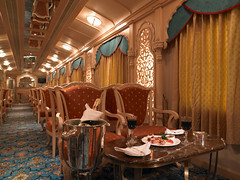 It is modeled on the lines of ‘the Palace on Wheels’, the first luxury tourist train in India. The Golden Chariot runs its trains on two routes. The first one called “Pride of the South” covers Karnataka and Goa states. The second train called “Southern Splendor” runs through Karnataka, Tamilnadu and Kerala states. These services are operated as a weekly service and the train can accommodate 88 persons on its 44 cabins across 11 passenger coaches. There is other general purpose coaches also. “Pride of the South” covers Bangalore, Kabani forests, Srirangapatnam temple town, Mysore the city of palaces, Shravanabelagola, Belur famous for the Chennakesava temple, Halebidu architectural and temple town, Hampi temple town, Badami famous for the rock cut temple and other structural temples, Pattadakal known for its historic temples, Goa famous for its beaches, places of worship and world heritage architectures. You are then taken back to Bangalore. This is a 8 days / 7 nights package covering Karnataka and Goa. “Southern Splendor”, another 8 days / 7 nights package tour. The journey begins at Bangalore and takes you to the historical Temple cities of Mamallapuram alias Mahabalipuram, Kanchipuram known for its temples and Silk Sarees, Tiruchirapalli the rockfort city and temple, Thanjavur and Madurai – historical temple towns of Tamilnadu. Then you are taken to Kerala state. The beaches of Kovalam and sandy shores awaits tourists here. You will glide by boat through the palm fringed and silent back waters to Kochi or Cochin or Ernakulam, the ‘Queen of Arabian sea’. Then you are taken back to starting point in Bangalore. If you are looking for southern India tours, these two trains offers the ultimate in luxury India tours. The Golden Chariot has two multi cuisine restaurants offering vegetarian and non-vegetarian food. There is a bar named ‘Madira’ which is stocked with international wines and spirits. The Golden Chariot has a conference room on another coach which offers a seating capacity of 30. The Golden Chariot offers Ayurvedic and spa therapies at ‘Nirvana Spa’ and a fully equipped gym is also there on board the The Golden Chariot. How Do I Book Tickets in Golden Chariot Train? The Golden Chariot have offices all around the world: in USA, UK, Europe, Switzerland, Canada, Australia, New Zealand and India.